The other thing is, well, my entire schedule. Work has been beyond busy. Believe me, I’m not complaining. I like to work and I like to be busy. This all comes, however, at a price…which is that this blog gets put on the back burner, pardon the pun. During the recent Thanksgiving, I was in charge of making a few dishes to bring to a communal dinner. In addition to the killer brussels sprouts recipe I made (more on that later), I wanted to make a low maintenance dessert to take that would be a bit of a showstopper. I ran across this recipe in a recent issue of Everyday Food. It’s a magazine that I’ve been a reader of since its inception. It usually has simple recipes that are almost always sure things. This cake mixed two of my favorite things: fresh cranberry taste and the notion of upside down cake – pineapple upside down cake is one of my favorites. It was one of the easiest desserts I’ve made in recent memory and made quite an impact at dinner. Guests raved about the sweet cake balanced with the tart cranberry flavors. – Preheat oven to 350 degrees with rack in center. Rub the bottom and sides of an 8-inch round cake pan with 2 tablespoons butter. In a small bowl, whisk together 1/2 cup sugar with the cinnamon and allspice. Sprinkle mixture evenly over bottom of pan; arrange cranberries in a single layer on top. – With an electric mixer, cream remaining 6 tablespoons butter and 1/2 cup sugar until light and fluffy. Add egg and vanilla; beat until well combined. In another bowl, whisk together flour, baking powder, and salt. With mixer on low speed, add flour mixture to butter mixture in three batches, alternating with the milk, until well combined. – Spoon batter over cranberries in pan, and smooth top. Place pan on a baking sheet; bake cake until a toothpick inserted in the center comes out clean, 30 to 35 minutes. Let cool on a wire rack for 20 minutes. Run a knife around edge of cake; invert onto a rimmed platter. Cranberries are so tasty! Thanks for the recipe! this cake turned my world upside down..i only have one word.;gorgeous!! !two weeks ago i made some upside down pineapple cake..next time i will try this one, although finding cranberry in France might not be that easy..
That looks delicious! I love cranberry and just might have to try out this cake. How far in advance did you make it? I have a party to attend this weekend and want to know if I could make it a few days in advance. It screams Christmas allover! And it looks beautiful – if only I could find cranberries, this cake would certainly be one of my Christmas desserts. I love cranberries and even found some in the market this year! Perfect dessert for Christmas – and, yes, it is a show stopper! the link to your cake isnt working! I’ll have to go search around your site to find it – i love me some pineapple upside down cake! i hadn’t seen Nigella’s version – i like the extra syrup hers makes. i’ll give that one a go next time! I made it the morning of. This cake is a little denser than you may be used to…so I would only make it a day or so ahead of time for fear of it seeming dry. Opps! I am silly – the parentheses messed up the link…. here it is! I made 2 of your cranberry cakes today. My 10 year old finally tasted cranberries and like them. Thank-you for the recipe. Tami, you lie. You said there would be more later about the yummy brussel sprouts and then nothing. I have a handful of those suckers and am looking for something fun to do with them. 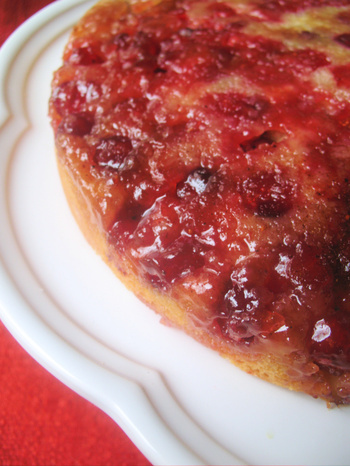 I have a similar recipe, only with brown sugar (in place of white) and slivered almonds added to the cranberry “topping.” It’s a favorite of mine – and the cake portion is so light! Hmm, I’m getting hungry . . .